WHAT DO ALL THE BEST UNIVERSITY STUDENTS ALL HAVE IN COMMON? 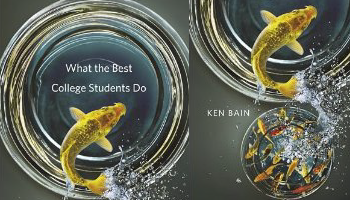 Getting good grades in college is not as important as developing a creative, integrated and lifelong learning style, writes Ken Bain, a university administrator and professor, in What the Best College Students Do, which will be published next month by Harvard University Press. Bain, who is provost, vice president for academic affairs, and a professor of history and urban education at the University of the District of Columbia, says the book looks at about 30 college graduates from all kinds of institutions — community colleges, liberal arts colleges and big research universities — who exhibited a lot of creativity and productivity in their post-college lives. In the book, which is geared toward students, he tries to figure out how their approaches to college explain their behavior. These students also believed that intelligence and abilities are malleable and expandable with effort, Bain says, along with a capacity for coping with emotional traumas by comforting themselves, finding a purpose in life, and using that purpose to motivate themselves to work. Citing a Swedish experiment from the 1970s, Bain says most learning approaches fall into three broad categories: the surface approach — students interested primarily in surviving the course — the strategic approach — students driven by a desire to receive good grades and accolades — and the deep approach. These deep learners use intrinsic motivators rather than extrinsic motivators, such as grades. “They found a passion within themselves rather than depending on someone else to motivate them,” he says. Instructors must give students ways to learn and find success through trial and error — all before making a mark in the gradebook. This way, students take time during the process to develop their interests instead of being motivated solely by receiving a good grade. The decline in funding and public support for higher education drives institutions, instructors and students to take a strategic approach to higher education, Bain says. Students are more likely to be in bigger classes, where they receive less individual attention to their own particular passions and interests, he says. “The changing political and economic climate has created a situation that makes it increasingly difficult for students to take that deep approach,” he says. Bain’s first book, What the Best College Teachers Do, published in 2004, addressed instructors from different types of institutions and disciplines fostered deep approaches and achievements in learning. The book featured some instructors who taught classes of 1,000 people, and they found ways to foster collaborative, deep learning even though they faced more difficulties than instructors of better-funded, smaller classes: “There are ways of doing it, it’s just more difficult to do that,” he says.